Oxynger KeyShield provides the world's best protection from keylogging. It is 100% protected against hook based, API based, kernel/driver based and hardware keyloggers. Ordinary anti-keyloggers only protect from some type software keyloggers. But Oxynger KeyShield protect its keystrokes from software and hardware keyloggers. 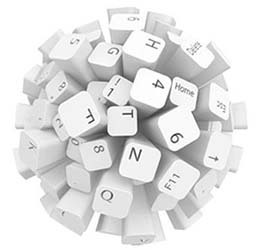 Most virtual keyboards (such as the virtual keyboard that comes with Windows) send normal keyboard event messages to the target program to type text. Almost every software keylogger can record these typed characters. Oxynger KeyShield do not use ordinary methods to send keystrokes to target application. Instead it uses a very secure communication channel for sending keystrokes to target application. Keyloggers will not be able to record keystrokes send through this channel. Oxynger KeyShield is protected from making its screenshots or video. Many modern keyloggers are able to capture screens while entering passwords using a virtual keyboard. Screen capture protection of Oxynger KeyShield is currently the world's best. It prevents taking its screenshot using screen logging programs and windows print screen function. It is also protected from video recording programs. Oxynger KeyShield provides superior protection from mouse logging. Protection from mouse logging is accomplished by not using the common QWERTY layout for positioning keys in Oxynger KeyShield. Instead it uses different key layouts for each user of the software. So each user gets a unique virtual keyboard. Thus hackers won’t get any idea of the key layout of Oxynger KeyShield in a remote computer. Hackers can’t record keystrokes using mouse logging without knowing the key layout of a virtual keyboard. Mouse logging is refers to using mouse position at each mouse click in a virtual keyboard to identify password. This is done by capturing the coordinates of each mouse click from edge of the virtual keyboard and translated to corresponding key. Mouse logging is used when keyboard layout of a virtual keyboard is known. Shoulder surfing refers to using direct observation techniques, such as looking over someone's shoulder, to get information. It is commonly used to obtain passwords, PINs, security codes, and similar data. If shoulder surfing protection is turned on, there won't be any key highlights for mouse hover and mouse click. Users can also use small keys or change the cursor to small black dot. This will prevent others from recognizing password by looking on the screen.